As of Monday, April 1 total oil product stocks in Fujairah stood at 23.277 million barrels falling 3.5% week on week, reflecting a fall of 855,000 barrels across all three stock reporting categories, with each category showing a fall this week. Stocks of light distillates fell by 3.0% week on week. Total volumes fell 353,000 barrels to stand at 11.243 million barrels. This is the third consecutive week that light distillate stocks have stood above 11 million barrels. The gasoline market in Asia was supported on turnarounds across Asia as the market entered the second quarter of 2019. Fundamentals thus far are still strong. However, this could only be temporary as once the refineries come back online, we could very well return to an oversupply situation,” one market source said. The 92 RON physical gasoline crack to front-month ICE Brent futures stood at $6.61/b on Tuesday. 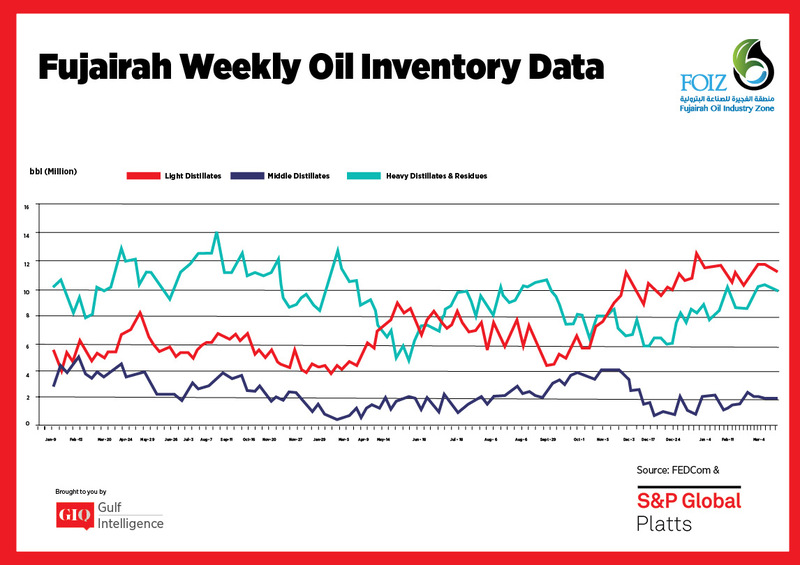 Stocks of middle distillates fell for the third consecutive week, showing a drawdown of 5.4%, with stocks falling by 116,000 weeks on weeks to stand at 2.047 million barrels. Overall sentiment in the gasoil market East of Suez was mixed to steady as upcoming scheduled turnarounds at regional refineries continue to dictate the near-term outlook of the middle distillate. Subdued market activity amid lackluster buying interest coupled with unviable arbitrage economics has weighed heavily on sentiment. In addition, observers pointed to the recent development on Chinese refiners having the option to switch their gasoline export quotas to gasoil and jet fuel. Stocks of heavy distillates fell 3.7%, dropping by 386,000 barrels on the week to stand at 9.987 million barrels. Overall market activity at the start of the week was said to have picked up with strong demand reported for bunkers in Fujairah. "Quite a lot [of inquiries]," said a trader. "It's going to be a busy day," another trader said noting the uptick in activity at the port. Looking further forward Germany’s Uniper said it is planning to undertake a debottlenecking program at its ultra-low sulfur fuel oil production facility in Fujairah in August. Uniper has two 40,000 b/d distillation columns in Fujairah which have been designed to process low sulfur crude oils to produce ultra-low sulfur fuel oil. 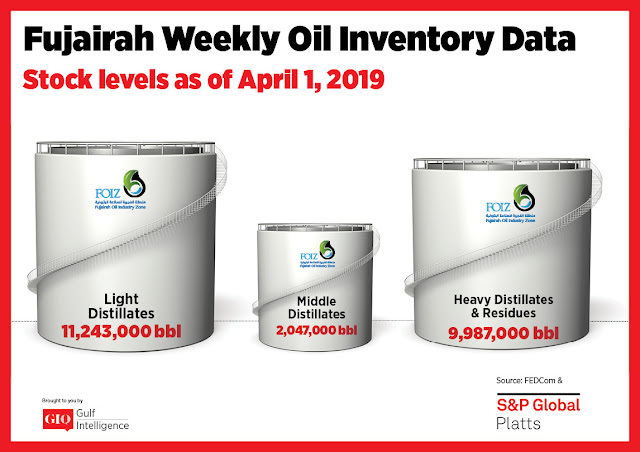 The Government of Fujairah in 2016 announced a plan to publish weekly data on refined products held at onshore commercial terminals at Fujairah as part of its effort to position the Indian Ocean port as a global oil trading and storage. 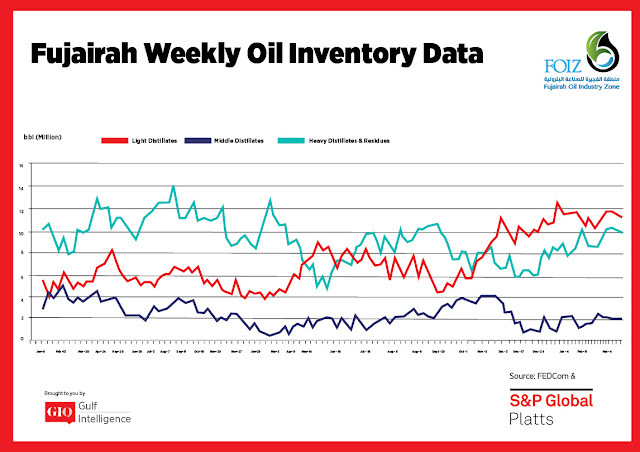 It appointed S&P Global Platts to distribute the weekly inventory data. FEDCom was established by the Fujairah Oil Industry Zone to collect, verify and distribute inventory data to replicate the data sets provided at other global trading centers such as Singapore and Rotterdam. Fujairah has about 41.5 million barrels of commercial oil product land storage available for leasing.